Nankang Rubber Tire Corporation wurde 1959 in China gegründet, richtete jedoch schnell sein Hauptquartier in Taiwan ein und wurde somit zur größten Reifenfirma des Landes. Im Laufe der Zeit hat sich die Marke einen guten Ruf angeeignet: Resistentes Gummi mit maximaler Sicherheit, zuverlässig und geräuscharm, die angenehmes Fahren jedes Fahrzeugtyps verspricht. Aber so viel Verständigkeit wäre langweilig und wie jeder gute Reifen hat auch dieser seine Geheimnisse. Seit Jahren brütet die Entwicklungsabteilung von Nankang über Lösungen, um ihre Reifen verstärkt für höhere Geschwindigkeiten auszulegen. Sobald diese auf ein Auto ganz gleich welcher Marke und welchen Modells aufgezogen sind, wissen Nankang-Reifen ihre Schnelligkeit und aggressive Bodenhaftung zur Geltung zu bringen. 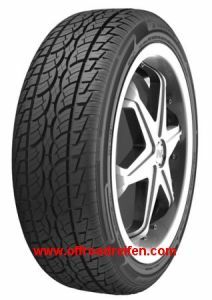 Nankang FT-4 1.Special profile design has been adopted to increase the tire rigidity and driving stability. 2. 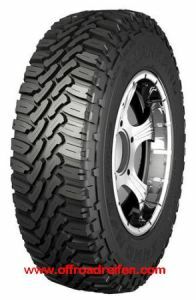 The tread surface has been enlarged and the shoulder groove has been reduced to give better maneuverability. 3.5-pitch block design has been adopted to reduce the noise generation. 4.Noise prevention bar has been created on the shoulder to prevent premature wear and to reduce the road noise generation. 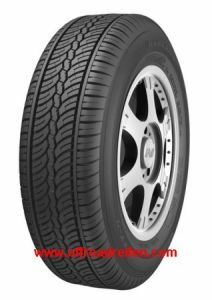 Nankang FT-7 1.Special profile design has been adopted to increase the tire rigidity and driving stability. 2.The tread surface has been enlarged and the shoulder groove has been reduced to give better maneuverability. 3.Zigzag main groove design has been adopted for rough road condition. 4.Gradual widening sub-groove pattern is aimed to divert the sands and rocks out more efficiently when cornering.5Noise prevention bar has been created on the shoulder to prevent premature wear and to reduce the road noise generation. 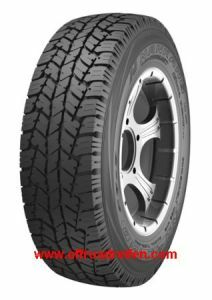 Nankang - FT9 M/T Terminator No matter on what ground be it gravel road, muddy road, sandy road, our computer simulated block designed pattern can perform excellent drive which suits all weather multi purpose tire. 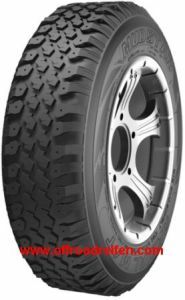 Nankang N889 Mudstar No matter on what ground be it gravel road, muddy road, sandy road, our computer simulated block designed pattern can perform excellent drive which suits all weather multi purpose tire. Nankang SP-7 1. Two straight broad groove & arc sub-groove design can enhance drainage efficiency and prevent from hydroplaning. 2. Noise prevention bar on the shoulder groove can reduce the pattern noise. 3. The blocks with sipes make the block stiffness feasible, improve the premature tire wear and riding comfort.